WHAT IS A T-SQUARE IN THE HOOF? When balancing the hoof, it is imperative to check for a correct T-square down the back of the pastern. My dear old Mum had a dressmaker’s square for measuring the distance of hems from the floor on my sisters’ dresses. A carpenter uses a carpenters square to cut perfect right angled ends on his pieces of timber. He also uses a spirit level to make sure his timbers are parallel and that the cross pieces are at perfect right angles to the uprights before he nails them. I use the word T-square; you might like to think of it as right angled, perpendicular, or 90 degrees. It all means the same thing. I was never any good at geometry, and could never make any sense out of my protractor and my set square if I could find them at all. The angles of my triangles always added up to more than 180 degrees, and my right angles were either more or less than 90 degrees, but I did get the general drift of the information, which was that the goal was that a right angle really had to be at 90 degrees if I wasn’t to get the ruler rapped over my knuckles. When teaching how to correctly balance the hoof, I always pick up the leg and tell participants to look for a T-square down the back of the pastern. Three issues have evolved from this. The first issue is that I am the one holding the leg and looking down the back of the pastern, and they are the ones standing at the opposite end and looking back at me and not able to see the T-square unless they actually swap places with me. The second issue is that a lot of people don’t understand what I mean by a T-square in relation to the hoof. The third issue is that knowing where the T-square should be doesn’t mean that you have a perfect T-square. This became increasingly obvious when I asked people emailing me with queries to check for a correct T-square in the hoof, and received back an amazing array of photos of Nowhere-Near-T-squares. Next time after your horse is trimmed or shod, here is a simple exercise for you to check on each of the four feet – hold the fetlock joint and view the leg from behind, looking down the back of the pastern and across the heels. 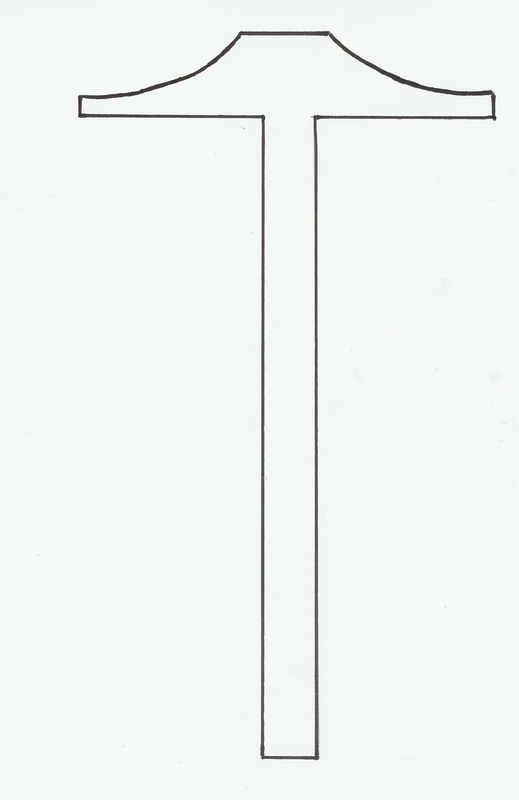 In a correctly balanced hoof the pastern should be perpendicular to a line across the heel buttresses – this is what I refer to as a perfect T-square. If you can’t imagine a line across the heel buttresses, then get yourself a ruler or a real T-square and put it on the hoof (Pic3). I think it is pretty clear once you know what you are looking for to see if your farrier is on the right track. As you can see in Pic 4, it is of no use whatsoever to apply a shoe to a hoof unless that hoof is correctly balanced with a perfect T-square. 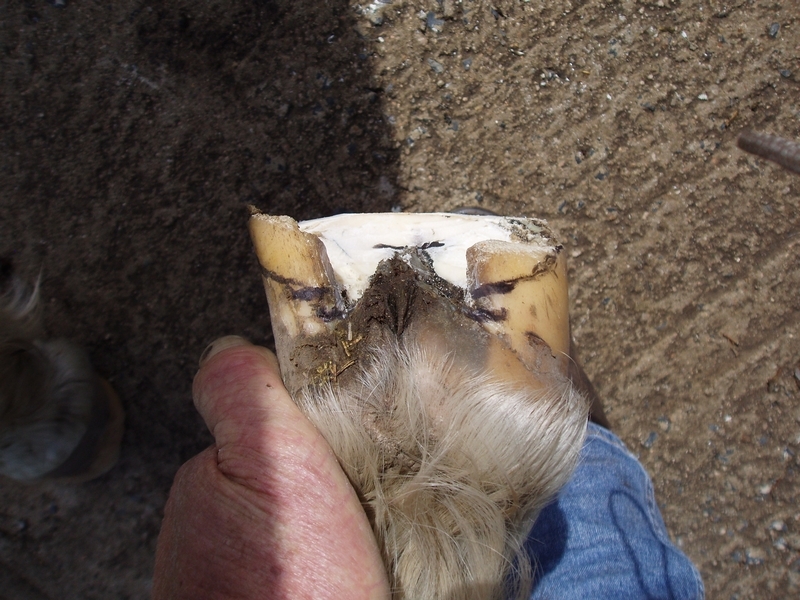 And 90% of hoof problems can be resolved simply by correctly balancing the hoof and checking for a perfect T-square. Another observation that becomes evident when looking for that perfect T-square, is that while holding the fetlock in this position, you are looking directly at the critical junctions of the heels. The definition of the critical junction of the heels is the junction where the widest part of the clean frog meets the hoof wall at the heels. We must never trim a horse down to this critical junction, as it causes the heels to be too low hence overloading the frog. 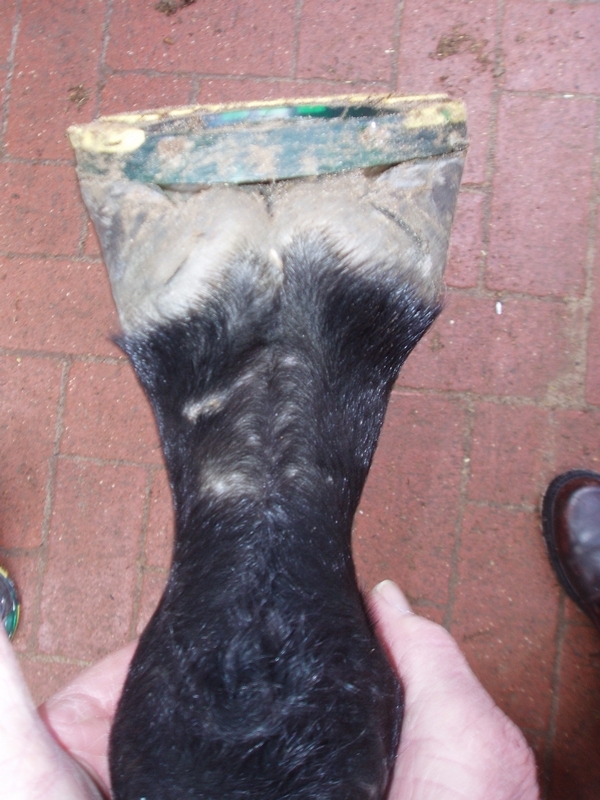 When the hoof is trimmed to be unshod, there should be 4 mm of hoof wall left above that critical junction after trimming. 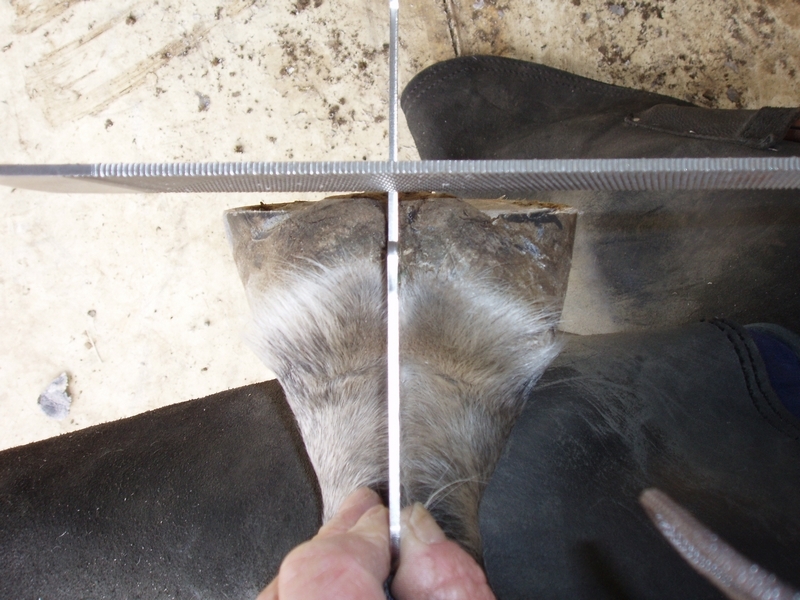 When the hoof is trimmed for shoe fitting, there should be also 6 mm above the critical junction of both heels. (Pic 5) And most importantly, the critical junctions of both heels should be of equal heights. And looking at the hoof from this position will show you instantly if the heels are even or uneven (or level or unlevel if you prefer that terminology). 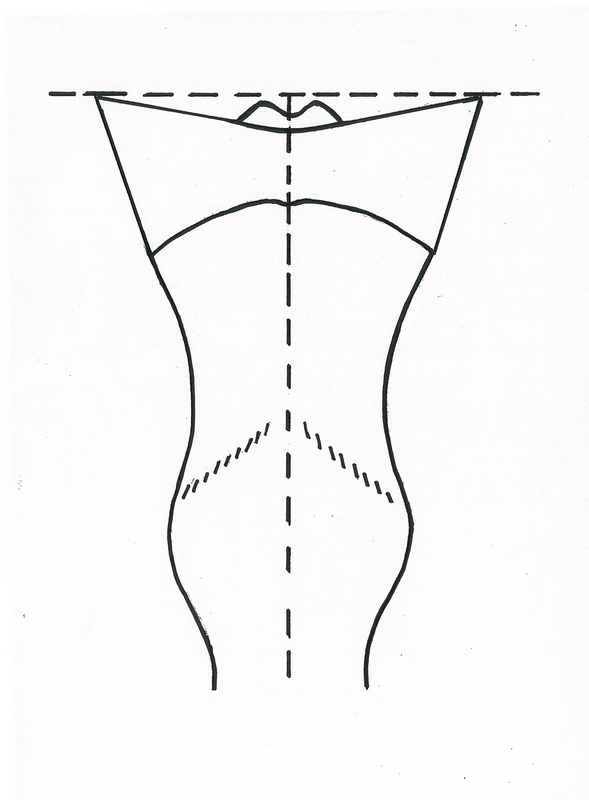 Now here is the interesting part – if a horse has a conformation fault, or is club footed, or has offset cannon bones, deviated pasterns or anything else, the foot still has to be a perfect T-square. Why? Because the foot has to land flat in order to take off correctly. With a conformation fault, after leaving the ground the foot will still swing wide or narrow as per the fault in the leg alignment from the knee down, but the hoof must land flat, and it will do so if the heels are level.